Crytek's technology could make any other shooter in the market, says Crytek's CEO. Crytek CEO Cervat Yerli thinks that the engine that he and his company have built for Crysis 2 is pretty special. It's so special, in fact, that Yerli doesn't think that any of his competitors' products is capable of doing everything that it does. He didn't want to categorically state that the CryEngine 3 was the best engine around, saying that the final word on that score would come from the people who used it. Yerli said that there was room for multiple engines in the market, and he thought that having variety encouraged innovation. He did say, however, that none of the other engines on the market could accommodate Crysis 2, whereas its engine could comfortably handle any of its competitors' games. He said that Crytek designed engines with efficiency in mind, which was the reason it had been able to do Far Cry and Crysis so quickly with a relatively inexperienced team. He added that the CryEngine 3 in particular was designed to make everyone, from designers to artists to coders, as productive as possible. Yerli certainly talks big, but as none of his competitors are likely to put his claims about CryEngine 3 to the test, it's almost impossible to definitively say whether he's wrong or right. He's certainly correct on one point, however, which is that it's what other people think about the engine - rather than the people who made it - that really matters. 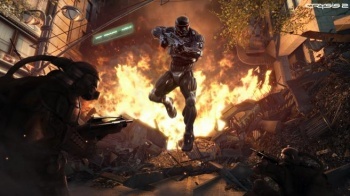 Crysis 2 comes out for PC, PS3 and Xbox 360 on March 22nd.